As far as the vegetables go, use as many as you like, or whatever you have. I probably cook about 4 or 5 cups total vegetables at a time when I make this. * About the carrot : get your potato peeler, peel the outside skin off the carrot and throw away. Now hold the carrot over a bowl and “peel” it into thin carrot shreds. Hit and drag the blade over the carrot fast and short to make short or long, thin shreds that are easier to eat than carrot rounds. If you don’t have a peeler, just cut them thinly. Or leave them whole for all I care. Carrots are carrots, and carrots are delicious. This is a basic recipe, so feel free to add pineapple, red pepper, etc. if you want, I like mine plain most of the time. Stir everything together in a sauce pan, bring to a boil. Stir often, when it is the right thickness for you, take off the heat and serve. If you have a steamer, this will be as easy as a yawn. If you don’t .. there’s hope and it’s still not that hard. Place 2-4 servings of rice in the steamer, put all of your vegetables in the steamer tray and let it all go until the rice is done. Non– Steamer : Boil 2-4 servings of rice, toss your veggies in oil and bake in the oven on 350 for around 20 minutes, tossing occasionally. If you have some thin items, make sure they don’t burn or toss them in half way through. 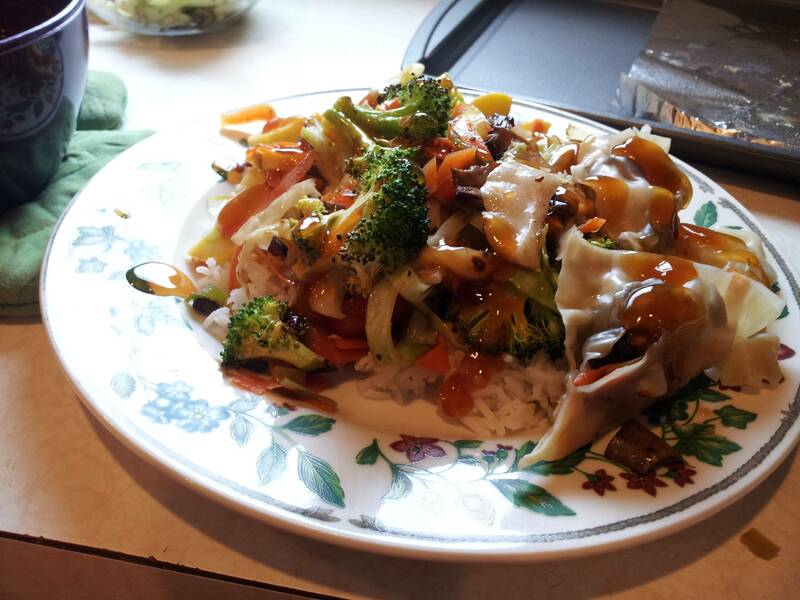 Get your rice, pour on some soy sauce, and some Sriracha, toss your veggies on, and pour some sauce over all of it. Eat immediately and enjoy. I will also try and post the recipe for the pot stickers I made along side this when I can find it, it’s here somewhere.